Recycling makes a big impact even a little recycling. For instance, if you recycled just 100 soda cans you can save enough energy to light your bedroom for two weeks. Every recycling bin you can fill is going to matter. What about the stuff that can’t be put into a recycling bin like a big appliance? It turns out that can be recycled, too if you hire the right junk removal company. That company would be Junk King Salt Lake City. Junk King Salt Lake City is proud to be the newest member of the national Junk King family. This is a company that has been collecting and recycling junk since 2005. Junk King Salt Lake City doesn’t do the actual recycling but they make sure whatever can be recycled is dropped off to the right facility. That might mean driving a few extra miles out of the way but it is a trip that Junk King is happy to make. If you need Junk King to take care of your big appliance recycling, then it probably means you’re replacing that appliance. A good fridge, stove or washing machine should last up to 10 years but after that, the service calls for repairs can start to add up. 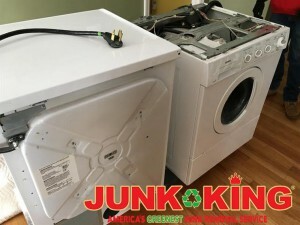 You can schedule your Junk King pick up on the same day as your delivery of the new appliance. Talk about a smooth transition! Along with getting your old fridge or washer hauled away, you can take full advantage of the Junk King crew by having them take away any other unwanted item on your home. It could be a sofa, a futon or a box of clothes. Junk King is also the perfect company to give all your old electronics to. The cost for Junk King’s service is very fair and affordable. Your flat fee will be based on how much space your stuff takes up on the truck. Thankfully, the crews like to get as much into as little space as possible. That is going to benefit your bottom line. The best approach to big appliance recycling and junk hauling is Junk King Salt Lake City. Put them to work today. This entry was posted in Salt Lake City appliance removal and tagged big appliance, junk, junk king, recycling on October 31, 2017 by Junk King. Last updated November 2, 2017 .